I am super excited to share this tutorial with you guys today. I showed you how to do the double halo braid HERE, but I wanted to also show you how to do a single halo braid as well. It is a bit simpler, but looks just as good! I hope you enjoy it! P.S. Don't forget to Subscribe to my YouTube Channel HERE! 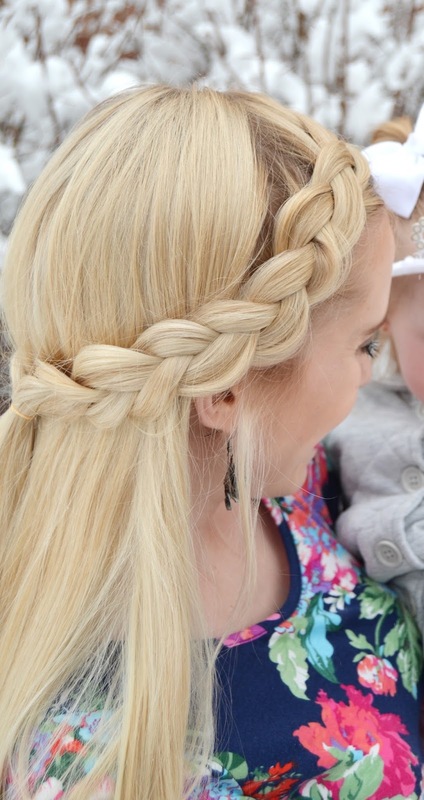 I am so going to try this braid - so perfect for summer! Thanks for the tutorial! I wear a side braid all the time. It's my go to style these days! I can NEVER do this braid but I wish that I could! Your hair is gorgeous! I wish mine was long enough to braid! That braid is so big and lovely! Loved your video! Your hair is stunning!!! I have been trying to braid my hair more often and your tutorial really helped! The braid is so pretty! Ugh, I'm so bad at doing my hair, but I may attempt this braid. It looks so pretty on you, and your daughter is so cute! Very lovely Rachel. I try and try with these kinds of braids and mine never turn out this good but thanks for this video as I may have to try it again, perhaps for Easter.